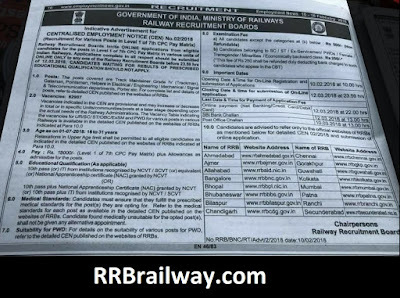 About Railway Group D recruitment notification 2018 – The notification of Railway group D recruitment 2018 was first sighted today. A photo of employment news dated 10-16 Feb 2018 has been shared by various sources containing the complete notification. RRC CEN 02/2018 Railway Group D Recruitment 2018 notification has been about to release. 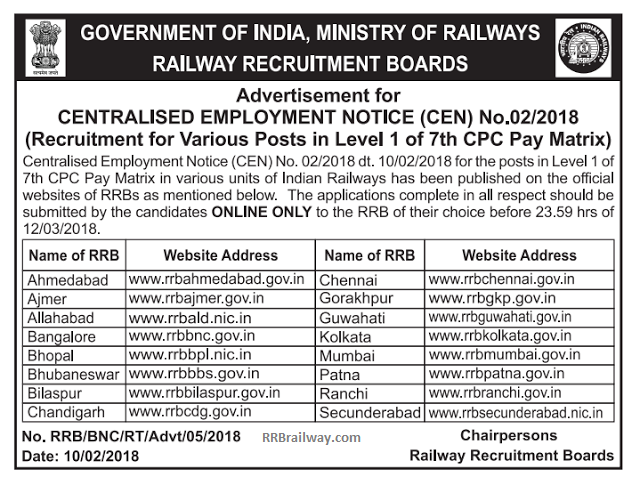 RRB CEN 02/2018 shows 62907 vacancies for various Grade 4 posts. The posts include gateman, pointsman,track manager / track man, helpers. Candidates who are eligible as per the Railway Group D recruitment notification 2018 can apply online from February 10, 2018, to March 12, 2018. Earlier RRC used to organize group D recruitment. But now RRB is looking after it. Get here complete details of Railway Group D Recruitment 2018 such as notification, application form, admit card, result, syllabus. Railway Group D Recruitment Notification 2018 PDF will be available very soon. Railwayy Group D RRB CEN 02/2018 shows that there are various vacancies in the grade 4 posts. The names of posts and overall vacancies are available. As soon RB CEN 02/2018 detailed PDF is available, specific vacancy details will be updated. Check all vacancies here. Only those candidates who fulfill eligibility criteria of RRB CEN 02/2018 can apply. It is the candidate’s responsibility to check eligibility. At the time of exam, railways will not check eligibility. Documents to prove eligibility will be required at the time of document verification. 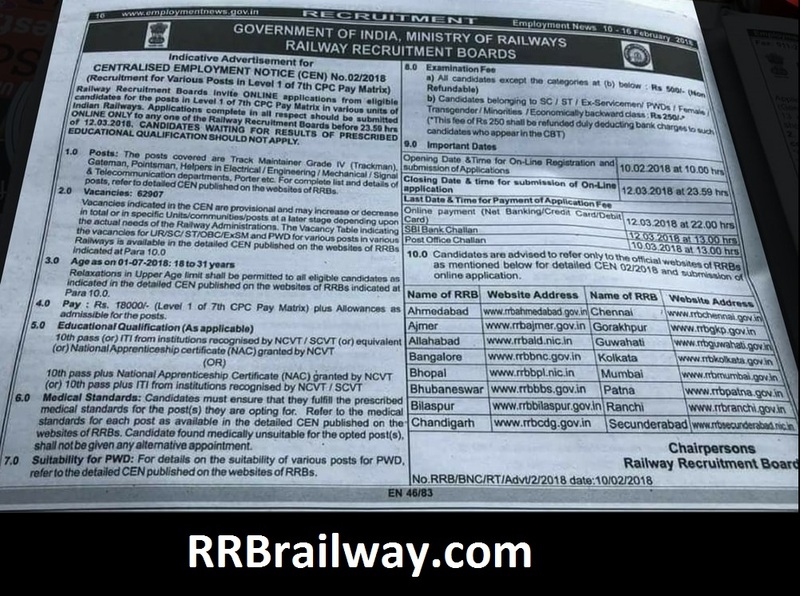 Recommended: Also read RRB ALP (CEN 01/2018) for 26502 vacancies. There will be relaxation in upper age limit for reserved category candidates. Details of relaxation will be announced through detailed CEN 02/2018. 10th pass (or) ITI from institutions recognized by NCVT / SCVT (or) equivalent (or) National Apprenticeship certificate (NAC) granted by NCVT. 10th pass plus National Apprenticeship Certificate (NAC) granted by NCVT (or) 10th pass plus ITI from institutions recognized by NCVT / SCVT. Candidates should make sure that they satisfy medical standards for that post which they opt as per RRB CEN 02/2018. Check medical standard of relevant post prior to applying. For suitability for PWD, see RRB CEN 02/2018 to see which posts are suitable for PWDs. There will be a computer based test for the selection of candidates for various group 4 / group D posts. The date and time of computer based test will be announced soon. The purpose of conducting a computer based test is to shortlist candidates by testing their reasoning, aptitude, and skills. Exam pattern of Railway Group D 2018 will be notified through RRB CEN 02/2018. Exam pattern will indicate details such as number of questions, marks per question, negative marking, duration. 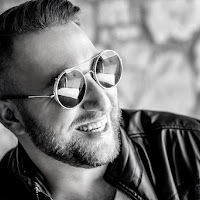 The level of exam will be as expected from candidates with the educational qualification mentioned above. Exam pattern of last time’s Railway group D recruitment was as follows. After candidates fill and submit online form, they will get login details. Using these login details they will be able to download Railway Group D Admit Card 2018. The admit card shall contain details of exam such as exam date, time, centre. Candidates will know about exam centre through admit card only. Thus, it is important to download Railway Group D Admit Card 2018 as soon as it is available and print it. It will be available for download at RRB CEN 02/2018 website.